This summer, we were hiking through the woods and found patches of huckleberries. Then, we found gobs of huckleberries. We had no idea that this would lead us down a 3-month path of foraging for fruit both in the forest and in our own neighborhood, and we have lots of fruit and canning projects to show for it! All said and done, we had to have gathered hundreds of pounds of fruit and maybe even over a thousand’s dollar’s worth. That brought up the next question… what on earth do we do with all of this fruit? In this post, we want to share a long list of ways to preserve fruit, including traditional methods like canning various jams and jellies and even some creative methods such as making soda, ice cream or even alcohol! The problem we personally have with fruit is that we don’t eat all that much of it, to be honest. We are much more about the meat and veggies, so finding ways to include fruit as a dietary staple (rather than preserving it in a way that would take a long tie to be eaten) we tried to get creative and can things that we thought would be eaten within the next year. To get an overview of what we personally did this year watch the video below, but keep on reading for additional methods of fruit preservation! First off… fruit preservation I think is quite simple. First, most fruits have a pH below 4.6 (most… but be sure to do your homework on every fruit you’re unsure of) which makes most fruit a good candidate for water bath canning. Meat and vegetables have too high of a pH to get away with this and require pressure canning which although I hear is easy, can be intimidating to get started with. While I won’t cover every conceivable recipe you can make out of fruit (heck, that’s why Pinterest exists!) but I’ll try to give some broad ideas and categories to get your creative mind working, and to let you know which methods we picked this summer with our harvest. One of the most obvious ways to preserve fruit is to can it! We personally like this method the most because up until recently we didn’t have a large enough freezer to store much of anything and even if we did, we live off grid which means we’re responsible for our own power and it isn’t always available in abundance, so while a freezer is nice we certainly don’t want to rely on it for our primary means of storage. That said, here are some things we played with or that can be played with. We hope to do a full post soon on getting started with canning, but one of the things we have in our homestead toolkit is a canning box that we pull out every time we get ready to can. It has everything we need and every tool has a specific purpose. Water-bath canner or pressure canner: The pressure canner can be used as a water-bath canner if you only want one tool for both jobs. Most frequently we use a water-bath canner that holds about seven half-pint jars. This is good for most recipes but if we’re really canning in bulk, we’ll use our Presto canner that’s a bit larger. However, it feels overkill for most of the things we do so why waste water if it’s not necessary? Mason jars, lids and rings: We always have on hand pint-sized, half-pint sized and quart-sized mason jars so that we’re always ready to can. It’s recommended to have new lids for each round of canning, although the rings and jars can be re-used. Ball Blue Book Guide To Preserving: This is our canning bible, especially as we are newbies. I start here with every recipe, and if I find a recipe on the internet, I compare it always to a recipe in here as these are tried, tested and safe. It has lots of great info on why we do what we do, how to can safely, and lots of great info on the pH of different foods. Ball utensil set: I didn’t purchase this right away because I didn’t know if I really needed it or not… after my first canning session, I bought this immediately! Each tool really has its own purpose including the jar lifter, lid lifter (from the scalding hot water), jar funnel and air bubble remover. Outdoor 3-burner portable stove: While I tried canning in our RV the first time, canning can be rather messy so we bought a 3-burner outdoor cooking stove and love it. We actually cook our real meals on this stove too as it’s too hot indoors to cook. When most people think of fruit preservation, they think of jams, preserves and similar goods! We personally don’t eat much bread or crackers, you know, things many people put jam on, so we were unsure if this would be a wise use of our fruit. However, we then stumbled upon the idea of using jams and preserves as a meat glaze, or as a base for a meat glaze! Did you know that sweet and sour sauce can be made out of apricot jam? I had no idea either! We tried it out and we LOVE IT by itself on meat… so after we discovered this, we went jam crazy. There is a difference between jams, jellies, preserves, conserves, butters and even marmalades, although in all honesty most have similar ingredients but I’ll give you a rundown of what I understand the differences to be. Conserves: A combination of two or more fruits. So technically, blueberry / strawberry jam wouldn’t be a jam at all, but a conserve. Jam: Traditional jams are made without added pectin but are firmed up by cooking crushed fruit and sugar to the gelling point. Some modern jam recipes call for additional pectin and therefor, a shorter cook time. Jellies: Jellies are translucent spreads that are firm in texture but are also easy to spread. This ususally means that only the juice of a fruit is used and the pulp is left out. Butters: A thick, smooth, rich spread with concentrated flavor. It seems this has the same ingredients (maybe a different quantity) of say a jam or preserve, but it’s all in the smoothness and even how long it’s cooked. Marmalades: These are sweet, tart spreads that contain small pieces of fruit or peel suspended in a transparent jelly. Preserves: I guess the difference between a preserve and a jam is that true preserves aren’t supposed to retain their shape when spooned from the jar. The texture should me more like a honey-like syrup or a very soft jelly. These can be made with our without added pectin. What do I like to make? Anything with as few ingredients as possible, especially pectin! While pectin does a great job at firming things up, part of the reason I can is to save money so I like to limit the containers of pectin I buy. 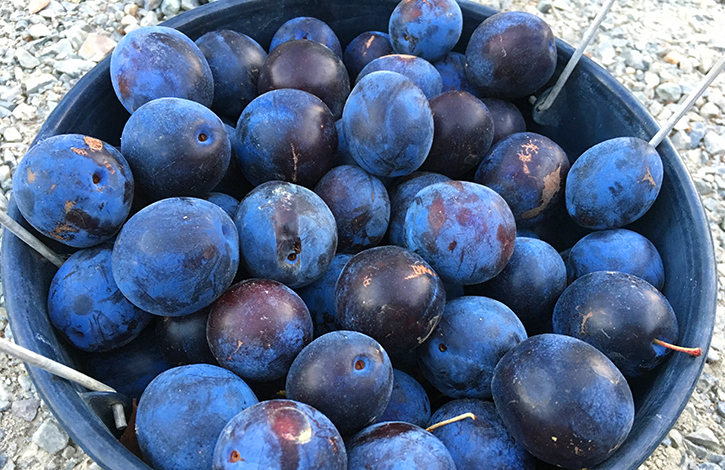 This summer we made preserves or jam out of apricots, red currants, black currants, plums, pears, huckleberries, thimbleberries, cherries, rhubarb and elderberries. We also made over 15 pints of apple butter… wowzas! Last, one of the huge perks of making preserves and jams is that they’re easy to give away and make great gifts. We ended up giving away many cases-worth of jam to friends, neighbors, family, and even used to them to trade for things of high value to us, such as trading for more cases of mason jars or for more fruit to can! Next up on the list are fruit sauces such as applesauce or pear sauce. In all honesty, you can get as creative as you want with these. 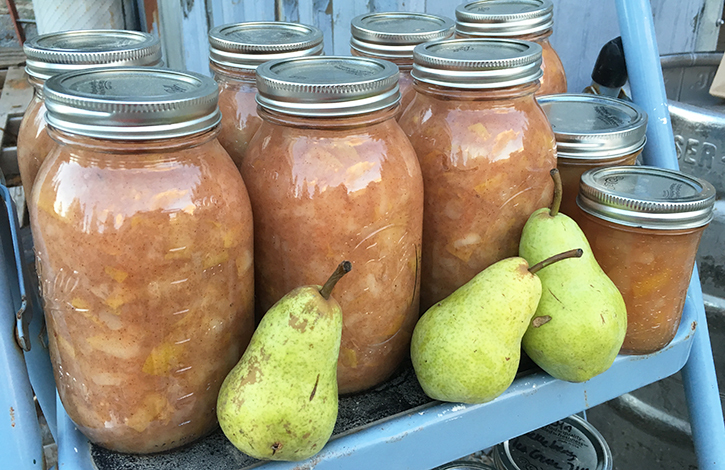 This year, we kept it simple and made many quarts of both apple sauce and pear sauce. This is something we don’t normally buy in the store but if we have it on hand it will likely be eaten! Organic fruit sauces are expensive so making them yourself is a great option, and it’s a whole food by itself where jams really won’t sustain hunger right of the jar. Syrup is a staple in some households as it can be enjoyed frequently over pancakes or waffles, or even be used over ice cream or to flavor drinks! The syrup opportunities are endless! We didn’t make any of this over the summer because we didn’t think we’d really use it ourselves, but included it here because YOU might want to make some! As I said before, preserving a bunch of fruit is challenging if you aren’t a huge fruit eater. That said, we found that making fruit salsas is a creative way to enjoy fruit. The only downside is that if you don’t have other salsa-makings, this may not be a cheap as canning free fruit alone, but it’s certainly cheaper and healthier than buying specialty salsas in the store! We were skeptical of the fruit salsa at first but the one (and only this season) we made was an apricot salsa, and it’s to-die-for! I had no idea it would be so delicious! I haven’t devoured all of the jars yet because when I do they’ll be gone, so I really want to have my cake and eat it too. This was the other canning experiment we ran with in hopes that it would be a more hearty way to enjoy fruit. Same problem as with the salsa… we had to buy additional ingredients. The cherry chutney we made wasn’t very palatable (although I will try it a second time)… but chutneys are too popular for them all to be bad. Don’t be afraid to experiment with chutneys… we will try again ourselves! I know lots of folks love preparing pie filling to have over the winter. We don’t have an oven, nor are we big pie eaters (or, if we have it we’ll eat it and we try to limit our consumption on TOO many baked goods) but this would be a great option for some folks! Our neighbors actually make an entire pie to put in the freezer so that when they want one, they pull it out, stick it in the oven and have pie shortly after! We didn’t do this with our summer harvest, but some may enjoy canning fruit whole. When we talk about preserving fruit, most people joyfully suggest dehydrating it. We personally don’t eat much dehydrated fruit but many folks do, so this is a great option for fruit preservation! Also, we don’t have a dehydrated and even if we did, it takes just a little too much power to run off our small solar setup. Anyone miss having fruit roll ups as kids? Well, fruit leather is a walk down memory land and is actually good for you! Store-bought fruit leather is ridiculously expensive but you can whip up a few trays of your own for pennies. My mom made apricot fruit leather for us as kids and we loved it! Next, if you’re pinched for ideas simply dehydrate the fruit. You can snack on it by itself, throw it in baked goods or granola bars, or even rehydrate it in something like oatmeal. The dehydrator we had a while back was this one and for so low in price it was actually quite efficient. Although we’re really eyeing this type of dehydrator when we purchase one again in the distant future. We did, however, find some juniper berries this summer and since we used these for our homemade root beer over the summer, so I plan to let those dry out. We bought ours online because we had no idea they grew in our backyard! This gets its own category to itself because it’s so good that it really should be its own food group. We were at the thrift store one day when we found a hand-crank ice cream maker when we had a lightbulb moment and realized that we should make our own! All you need to make basic fruit ice cream is cream, sugar, lemon juice and rock salt! An ice cream maker is kinda one of those things that many use once but then never again, so we were happy we got ours for a few bucks, but we have used it three times so far for a total of three gallons of ice cream. We buy the expensive ice cream in the store, you know, the kind with real ingredients, so making our own ice cream saves us money and is probably healthier for us. We made both huckleberry and elderberry ice cream… and the huckleberry especially was to-die-for! Now that we have an upright freezer, we can store even more ice cream! With hundreds of pounds of fruit you can only have so many jams, so we put our creative thinking into high gear and started thinking about beverages we could preserve. After all, we do enjoy something other than water at least once a day whether it’s juice, a healthy soda or even small amounts of alcohol. I believe most alcohols can last a very, very long time. My guess is that because not much grows in alcohol, hah! We like the idea of making and preserving alcohol because booze is a specialty item and is highly-valuable to give as a gift or keep on hand for a trade. Our neighbors let us pick a lot of their fruit in exchange for some of the alcohol we would make with it… it was a win-win for both of us! Wine is something that’s enjoyed by many, but we prefer mead over wine… at least the mead we’ve had. I’m not sure on wine, but mead is extremely simple to make and the main ingredients are fruit or fruit juice, yeast and honey (3lbs or so for a 1-gallon carboy). 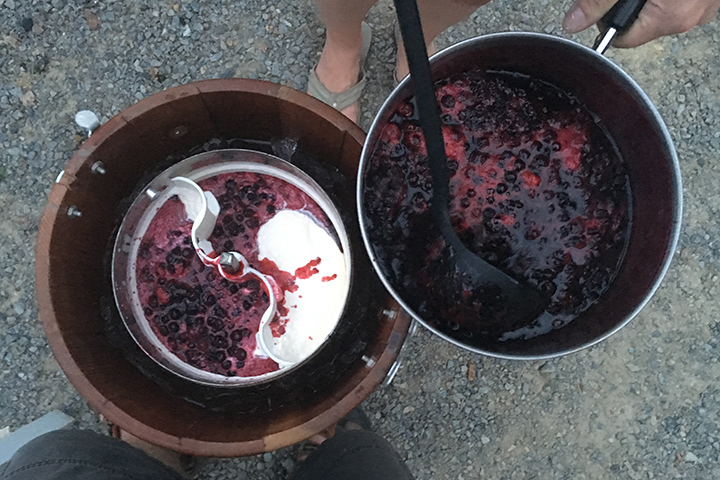 In the end, we ended up with probably five gallons between our huckleberry mead and black currant mead. Another option is to make a fruit-flavored liquor… some also use the word cordial. We don’t drink hard alcohol of any sorts (we have nothing against it, it’s just not very palatable to us) but that could also be a great way to use up some fruit. While many recipes call for a base of some type of hard alcohol or another (rum, vodka, whiskey, etc.) it certainly could be spiced up with the summer’s harvest. These could also make excellent gifts (low-cost Christmas gifts, anyone?). The other beverage we preserved this summer was fruit juice – and lots of it! I feel that fruit juice can be doctored up in any way you see fit whether it’s adding it to some sparkling water or turning into a probiotic soda (see below)! The great thing about fruit juice is that most of it can be canned, although if you’re new to canning it’s still wise to follow a recipe to ensure the pH is low enough for using a water bath canner. We made juice out of rhubarb, bing cherries, rainier cherries, elderberries and even made some apricot nectar. After spending too long on Pinterest, I discovered that I could make my own soda out of any juice, hence the reason I canned so much fruit juice! Making soda is simple. All you need is juice, sugar (unless it’s in the juice already as I canned it myself) and a starter culture which can be a ginger bug or whey (learn how to make your own whey here). I had fun experimenting and did half with a ginger bug and half with whey. We put the soda in these bottles which were a hit and made the beverage feel even more of a luxury. Nothing was better than popping open one of our homemade sodas after a long day of cutting firewood in the heat of summer. Last but not least, freezing. We opted to not freeze fruit because for the majority of summer we didn’t have a freezer, nor do we think we would use it if we had it, but for many folks it’s their #1 fruit preservation method! I don’t think I need to go into too much detail on this one, but the things you can do with frozen fruit are endless. One time, my sister convinced me that I could make a wine shake out of cheap wine and frozen fruit. The verdict? It was shockingly good, hahaha! So all said and done, I didn’t think I’d ever get tired of canning but I canned what I think is the last of the fruit today and I have to admit… I think I’m done for the season. I might be able to pick up a little more fruit here and there, but I think it’s time to focus on other projects that we have in the works. It was a great canning season, and I’m so thankful for the opportunities we had and for everything that we were able to learn! What are YOUR ways to preserve mass quantities of fruit? Do you have the same problem I do in that you don’t eat a ton of fruit so you’re forced to get creative with your preservation? Let me know in the comments below! Off Grid Living Appliances: We Got a Chest Freezer! I had no idea citrus was known for having pectin… great to know! I knew apples had pectin and yes they firm things up wonderfully as well, maybe too much! Thanks for sharing your tip. Wow, you have been busy and everything looks so yummy! Here in our cold climate we don’t get a a ton of fruit. Fruit is precious, a lot of it gets eaten direct in the garden. I also love simple sugar syrup canning, maybe because it preserves the structure and taste of a fruit. Enjoy all your goodies! We are in a colder climate but a micro climate so there’s actually a lot of fruit in the area… darn! Haha! To be fair though, vegetables are probably more important for sustaining hunger. We will certainly enjoy our goodies! Great article! All the preserved fruits look terrific. I think I am getting a bit hungry! Congrats on your success and creativity. My grandmother canned her whole life without using books or the internet. It was something that was just learned growing up and recipes passed around. My uncle and grandfather made the wines and cocktails from the grape vines and fruit they had on the farm. I helped my grandfather many times take things he grew or made on the farm to a local country store in exchange for items he did not have on the farm. A big thank you to Jesse for wearing a sidearm while out in the woods (as seen in the video). I have seen hungry wild animals come out of unexpected places while out in the wild. Better be safe than regret it later. Again congrats for learning doing what our ancestors before us did because it was just a way of life for them that was passed on from their parents. I am sure you will pass it on also. Remember the movie Baby Boom? Remember what was done with all the apples from the apple orchard? It’s so fun to hear other people’s stories! Our generation would be so lost if it weren’t for the internet, and Pinterest specifically. My mom has one or two recipes saved from her grandma in a recipe book for cookies and some soup, but it’s nothing today like it used to be. Of course, maybe it’s a little different for people that grow up on farms. I’ve not seen the movie Baby Boom… I guess I’ll have to add it to the list! I was wondering if you were fallowing this family in Idaho living in a yurt and building there house? Alyssa, good job with all of your canning. Enjoyed your video. I noticed that you stacked all of your canned goods on top of each other. I recommend not stacking more than 3 cases upon each other. The weight of the jars filled with yummy goodness can damage the seal. You worked so hard, I would hate to see you lose this food. Cheers!! Thanks for the tips! Some say don’t stack them at all. I’ll check my seals, especially the ones on the bottom. That would be terrible to lose them. Wish me luck! Hi. love your enthusiasm. I just wanted to remind you that winter in Idaho comes with its own fun long cold chores. I am not loving the rain and mud. I actually end up just as busy in the winter as in the summer. Great post. I feed stuff that I make and don’t like to my chickens so nothing ever goes to waste here. As a lover of oatmeal (quick style oats) and not a big fan of fresh fruit (like yourselves), I highly recommend fruit preserves, in any style, in oatmeal as a really good winter breakfast. Let’s face it, oatmeal by itself can be pretty grimm, but a couple tbsp of fruit preserves in a bowl of hot oatmeal makes even the bleakest winter day just a little bit better. Looking into presser canning Chicken, Venison and Beef. Great ways to preserve meat with out refrigeration. Great idea! We didn’t get the opportunity to try that this year but hopefully next year… especially because we think we’ll be able to get our hunting licenses! Thanks so much for sharing. Am going to try the soda with water kefir/fruit. Love the taste of ginger and lemon. Also this is a pain reliever. Have you tried honeysuckle jelly. It is so good especially with the lemon or the lemon and ginger added. I look forward to reading your blog. Have a wonderful winter. You’re welcome! We’ve not tried honeysuckle jelly but would love to! I ate honeysuckle right off the flower as a kid… such a fond memory! Have a great winter / fall as well! 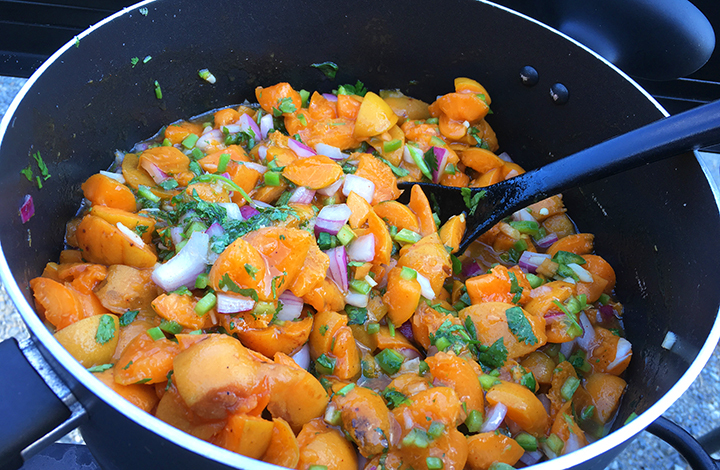 Not sure how your cherry salsa will work, but I use my choko chutney, as a base for curries. You know how you can buy those jars of curry sauce, for mega bucks, and just add them to meat? Well my chutney (I guess you could call it similar to salsa) is used as the sauce base, with curry powder added. It makes the best curry! The beauty of curry is, you can use leftovers and older meat, boil it to billyoh, and it tastes like fine dining. Interesting… I love curry but Jesse isn’t a fan… likely because he hasn’t had good curry! We’ll have to experiment when we’re feeling brave, at least with our cherry chutney. It’s my greatest hope that it can be saved!!! I noticed the steep hillside on your property. Have you ever considered using a small area of it for a root cellar to store your canned goods and vegetables in. It would be ideal. Maybe the next time you get the small backhoe you could carve out a small cave into the hillside, shore up the walls and overhead with some timbers then put a door on the front of it. Just an idea. I know you have so much to think about and you two are doing a great job with what you have. Sometimes creative ideas come from out of nowhere. Another thought that occurs, and this is a bit out of the box, but bear with me. I watched a british tv series on youtube a bit ago, called Tales of the Green Valley. Worth a watch if it’s still available, but basically a team of people ran a period (16th century) farm, and used all the methods, clothes, materials available in the 16th century. But one of things that struck me the most was the diet and how they used what they had when they had it. Considering that fruit was looked upon with suspicion, they did come up with some very creative ways to use fruit in their main dishes. They’re are examples of foods and the books where the recipes come from. That might give you some ideas to use up your fruit in interesting ways. Cool! That sounds like a fun show. We’ll have to see if we can find it. Thanks for the suggestion! Awesome posts! Try getting kefir grains, you only have to buy them once… sooo much you can do with them and as healthy as it gets! Something i made this year which has been a huge hit is homemade HP sauce. I found a recipe online that used 12c each plums and apples plus other ingredients. Best condiment with meats and eggs and such. Takes some time but great way to use up lots of apples and plums. I have made 4 batches already. Great for gifts too.